Next time you eat an artichoke, make these. Whisk together mayo made with olive oil, a little non-fat Greek Yogurt to cut the fat, and balsamic vinegar. Transfer into small bowl. Get the best quality butter possible. Melt butter in a sauce pan or microwave...which ever you fancy. Pour into small bowl. In a covered jar, pour in extra virgin olive oil, balsamic (or red wine or champagne) vinegar, spicy mustard with the seeds in it, salt, pepper - and if you want to get fancy - fresh herbs like tarragon and oregano. Shake well until incorporated, and pour into small bowl. Well that was easy. Now go make these, eat an artichoke, and tell me which is your favorite (or your go-to dip). Love this. 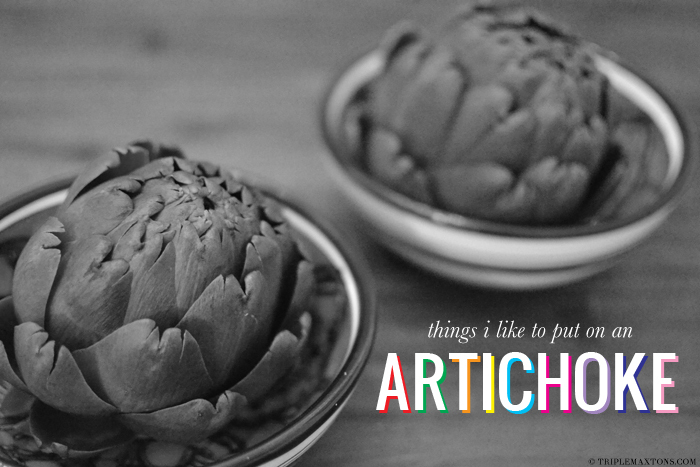 Artichokes are one of my favs. Gonna have to try your dips...I usually go with a garlic-lemon mayo. Yummy! My favorite is a little white truffle oil with pomegranate or citrus balsamic. It's SO delicious. I love grilling artichokes! I'm all about dipping it in some balsamic mayo- yum! Can you believe I've never eaten an artichoke? Clearly this needs to be remedied immediately. Preferably with butter.